New Hampshire is known as "the granite state" and what could be more fun for kids than climbing on big rocks and exploring caves? I haven't forgotten the teenagers, and there is plenty for them to do here too. The whole family will find plenty of opportunities to explore the great outdoors, in all seasons, in this beautiful state. If you are looking for a learning trip, the kids won't know that they are getting an education while they view wildlife on a nature walk, or do hands on, fun experiments at the science centers. I was born in New England and have lived in New Hampshire since 2005. Many of the places I mention on this page I have personally visited and all photos are my own. New Hampshire has mountains, fresh air and crystal clear lakes. We also get a lot of snow. I hope you'll be ready to get some exercise on your trip to New Hampshire. Most fun activities require some exertion. Summertime is when many tourists visit New Hampshire to enjoy the beautiful lakes region and climb the famous mountains. Fall is also a busy time as people visit from all over the world to see the gorgeous New England foliage change to it's bright colors. Winter brings out the skiers and snowboarders and New Hampshire has many ski mountains and snow tubing areas all over the state. Whatever you plan to do, it's best to check with the location ahead of time if the weather is bad, or it's mid-winter. Some places, like Ruggles Mine, close for winter. Just be aware that not all attractions can be enjoyed in the snowy, cold winters of the northeast. Many attractions close for the winter in the northeast and others open in their place. In most cases it's just not safe or fun to navigate the slippery roadways or mountains, but skiing, snowmobiling and other winter sports take the place of the summer fun. Just call ahead to check if you are unsure. Hiking is enjoyed by most everyone in New Hampshire, but you can also drive up some of the mountains. The beautiful mountains beckon us to hike to the top while enjoying nature and maybe even some great views along the way. If you have small kids who can't make a long, tiresome trek, there is Pitcher Mountain in Stoddard, which is in the south-western part of the state. This mountain is quite easy to climb, compared to many, because you will drive up the hills before getting to the parking area. And the view at the top is fabulous. If you are there in July and August you'll find many wild blueberry bushes loaded with fruit. Picture: Photo taken at the top of Mt. Washington, summer 2012, with the Cog train going back down and the Auto Road beyond. ** In winter (weather permitting) you can book a SnowCoach ride up Mount Washington to "above the tree line" in a van with treads instead of tires. Fly into one of the two major airports in NH and book a rental house for your stay. Choose your destination location and rent a place directly from the owner. Check rates and reserve a rental car. Find a car to rent while you stay on vacation. The two major airports in New Hampshire are located in the southeastern part of the state. The Manchester Airport is the larger one, yet is still not huge. Farther to the east, on the coast in Portsmouth is the smaller, Pease International Airport. This one is quite small and not all airlines fly there, so you may have to choose to fly into Manchester. Just over the border in Massachusetts is the huge Logan Airport in Boston. These places are fun for all ages. McAuliffe-Shepard Discovery Center and Planetarium has lots of hands on fun for kids of all ages and the older kids will enjoy views of the sky and planets during the show inside the Planetarium. When we visited, my son (age 11 at the time) had fun trying to land the plane in the simulator. The Discovery Center is located in the capital city of Concord. SEE Science Center in downtown Manchester contains a huge LEGO display made of three million LEGO bricks depicting the historical Millyard area of the city as it was circa 1900. It also has many hands-on exhibits on two floors. Squam Lake Science Center is in Holderness which is in the north-central part of the state. It is an outdoor type zoo that features native wildlife such as bears, deer, otters, big cats, eagles and more. Explore caves and collect rocks and minerals at this unique spot. Even many residents of New Hampshire have never heard of Ruggles Mine. Maybe this is because it is located away from the city areas, in Grafton, but the drive is worth it because you will probably never visit another spot like it. Ruggles Mine is an old mica mine, but it is wide open with just a few short tunnels to explore. The best thing about this place is that you can collect all your own rocks and minerals! Chipping away at the rocks is allowed (in certain places) and the sheer size of walls here is amazing. The mine is located at the top of Isinglass Mountain so the views are spectacular too. The mine has quite an interesting history as the land owner went out of his way to keep his profitable mine a secret for years. You may like both, but which is your absolute favorite? I have great memories of trips to the White Mountains as a kid. The Kangamagous Highway was wonderful, too. I live here near the lakes, and the mountains. I visit both quite often. 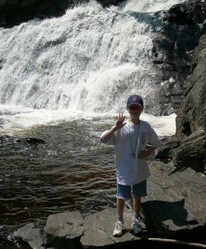 My kids and I hiked Mount Washington when they were 7 and 3. We camped out overnight, and it was marvelous. I can't imagine living anywhere else. Hiking the mountains. I love hiking and the scenery is breath taking. I can just smell the autumn scent wafting through the air. Visiting the beautiful lakes and waterways. I don't like my own question here. I love them both, but I really love hanging out at the water. Kids of all ages will enjoy these spots. There are a couple of places that are fairly near each other where trails will take you over rocks and past waterfalls. Lost River Gorge and Boulder Caves (pictured) and Flume Gorge offer these types of treks. They are located in the towns of North Woodstock and Franconia, in the White Mountain area. We visited Lost River this summer (2012) and it had been pretty dry. I imagine that there is usually more water and bigger waterfalls than what we saw. I would recommend these places for all ages, but there are stairs and lots of walking. You can't get lost in the caves, they are basically crawl spaces through and under big boulders (not everyone will fit, and there is one that is really small). Pick and choose the ones you'd like to explore, as they are all along the pathway. My teenage son climbing out of one of the "caves". Some of these caves are a very tight squeeze and not everyone is small enough to fit! I think that any pre-teen or teenager would have a blast at these attractions, and so would the adults! If you want to keep the older kids happy, here are some great places to try. Alpine Adventures, in Lincoln offers first time and experienced zipline tours, off-road fun in a Swiss army transport vehicle and the "Thrillsville" aerial park. Age, height and weight restrictions apply. The ZipRider at Wildcat Mountain is for those who don't mind heights. You must be a certain height and weight to do this. Click the link to read more and see a photo! In Conway not only can you rent kayaks, canoes and go tubing on the Saco river, but if you ever dreamed of swinging on a rope out over the water, you can do that too. Try out the newest thing - Stand Up Paddleboards (SUP) if you are coordinated enough to stand up and move down a river! I've never been here, but it looks like great fun with many options for length of rides / trips and if you go tubing they will even rent you tube to hold your cooler so you can bring along drinks and food. In winter snowmobile rentals can be a nice alternative to skiing. Have you ever taken your teenage kids to any of these places and if so, what did they think? My older kid(s) had a blast. My kids and I have done most all of the things you've mentioned. They both love getting out and doing things. It's fun exploring nature once in a while. Take a cruise on a pristine lake, rent a cottage, go paddleboarding, kayaking and fishing. Here are a few of our famous lakes, but there are many more. Lake Winnipesaukee is the largest lake in New Hampshire and it's part of the Lakes Region. Mitt Romney owns a home on this lake. Other smaller lakes in the area give this region of the state it's name. Squam Lake became well known when it was used as the location for shooting the movie "On Golden Pond" with Henry and Jane Fonda. Lake Sunapee (pictured), located in the western area of the state, is where musician Steven Tyler, of Aerosmith, has a home. It's also one of the most pristine lakes in the country due partly to it's high altitude. Take a lake cruise. Sit back and relax as you enjoy a ride around or across the lake while the captain points out interesting scenery and give a history of the area. The picture was taken this summer when my family went on the Lake Sunapee Cruise. Two ships are available and one offers a dinner cruise in the evening. Across the state, the large ship, MS Mt. Washington cruises the big lake - Winnipesaukee. Rent your own boat, pontoon, or Sea-Doo for the day, or by the week. (Be aware that in some instances you will have to take an online course to qualify to rent a boat.) Search for 'boat rentals' in the area you plan to visit to get more information from the marina. Go fishing. In New Hampshire kids under 16 can fish for free. Get your own license online at any time of day. If you are taking a winter trip to NH, try some ice fishing! You'll have no trouble finding big and small ski areas all over the state, and some offer tubing for the kids. New Hampshire has many mountains for skiing and snowboarding, but many also offer tubing. I've never been tubing, but my kids have gone and had a lot of fun. It's basically sledding on a tube. Most places have age and height requirements, so check before you plan the trip. McIntyre Ski Area is located in Manchester. Check out the pictures and read the rules and info on this page to know what to expect. Granite Gorge in Keene, is a smaller ski area, with tubing, and it's fairly new. It's located in the south-western part of the state. There are many ski mountains that offer tubing in the White Mountains. Check this link to find what you are looking for. Bet you can't wait to get here! Thanks for viewing Peggy. It is a beautiful state. New Hampshire sounds like a great place for outdoor fun! I love the water (and the mountains!). I lived in Mass. growing up but we always went north into NH for vacations at Newfound Lake and other areas. Maybe we vacationed in the same spots way back when! I spent all my summers in NH growing up. I lived there and in Vermont until a few years ago. I love going back to visit. You need to explore the lakes region and the White Mountains. That is the prettiest area in my opinion. We have been to Hampton Beach quite a bit but have never explored other areas of the State. Thank you for the great ideas...This might be the perfect adventure to take my grandson on this summer! I agree with you Ed, it is peaceful and beautiful in this area of the country. Thanks for adding comments to this page! If you have children and you need to run errands or go on a long journey, activities for children, that you can take with you, are a must.